Issues With Your Garbage Disposal? One can fix garbage disposal problems pretty easily if they know exactly what the problem is. Currently one of the most common concerns with the device is a stuck flywheel that causes it to stop turning. This kind of problem can usually be detected by the small humming noise the garbage disposal lets off when turned on. Following are some of the steps this unit can be fixed. This is the most important step of all so don’t forget it! Skipping this one can cause injuries when working on the device so make sure the plug us pulled off the garbage disposal unit. There are actually several ways of dislodging whatever is stuck in the flywheel. The first and probably the easiest are using the offset wrench usually provided along with the garbage disposal unit. For those who have misplaced their wrench, most hardware stores have a replacement so dropping by and purchasing one is fairly easy. Once the wrench is on hand, simply push it down until it reaches the flywheel. Simply turn the flywheel until whatever is dislodged breaks free and that the flywheel manages to turn around again. Make sure that the turning motion of the wrench is clockwise since this is the motion in which the flywheel moves. After the flywheel starts to turn around freely, it’s time to try out if the problem is solved. Reconnect the unit but don’t turn it one yet. Check out the bottom and look for the red Reset button and simply depress this before turning the device on and off. Pushing in some water might also be useful to smooth out the turning process as well as remove other waste residues. 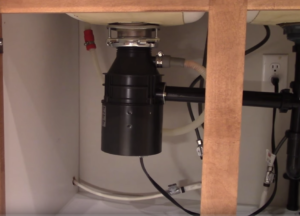 This should be able to fix garbage disposal and could be done by someone relatively inexperienced. Just keep in mind that no matter what happens – the hand must NOT get within the device. Use something sturdy and unbreakably instead. Of course, there are also other problems one might encounter with their garbage disposal unit. For example, it could be leaking or not running altogether. When these problems occur, it is important to understand the anatomy of the garbage disposal to be able to pinpoint exactly where the leak is coming from. After knowing where it is, then that is the time to address the problem. As for the “not running” problem, this is usually dealt with through checking the connections of the unit or pushing on the Reset button. Should there be any problems beyond that, then calling the expertise of a technician is the best option possible. Considering how much a garbage disposal costs, it’s crucial that major fixes are done by a professional. Keep in mind that regardless of what fix garbage disposal option is available, it is important to completely unplug the device and not just turn the switch off. Safety should be the major concern of every individual utilizing the garbage disposal unit.